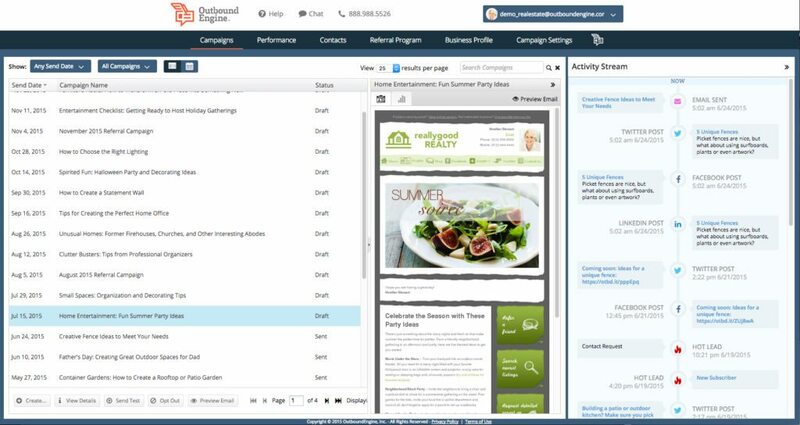 OutboundEngine is email marketing software that couples outbound campaigns with cross-marketed social media and landing pages to engage new and current customers. Landing pages: OutboundEngine’s landing pages, which are suitable as stand-alone websites, serve as powerful marketing hubs for email recipients. Pages display dynamic social media activity, previous emails, agent information and numerous calls to action. 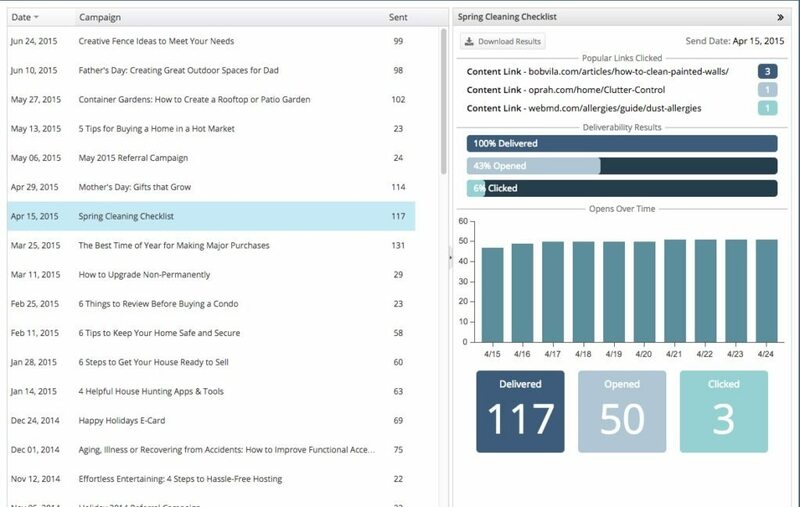 Hands off: After a required onboarding process, agents with little time to manage their marketing can rely on OutboundEngine to generate campaigns, post to social media and build your database. Occasional looks into your account dashboard would be worthwhile. Social promotion: OutboundEngine’s robust scheduling capabilities include consistent, automated promotion on social media (Facebook/Twitter/LinkedIn) of upcoming twice-monthly newsletters. OutboundEngine’s appeal is in its automation, so agents seeking custom local content for campaigns will want to maintain oversight of their accounts. I pressed OutboundEngine hard on its content sources. All provided content emanates from in-house writers or carefully vetted and regular freelancers based in the United States. Although some articles may appear similar in subject, each is written individually, so customers are assured of fresh material. In some cases, if you want OutboundEngine to create local market content, they’ll outsource specifically to your market for an added cost. All editing is done in-house. 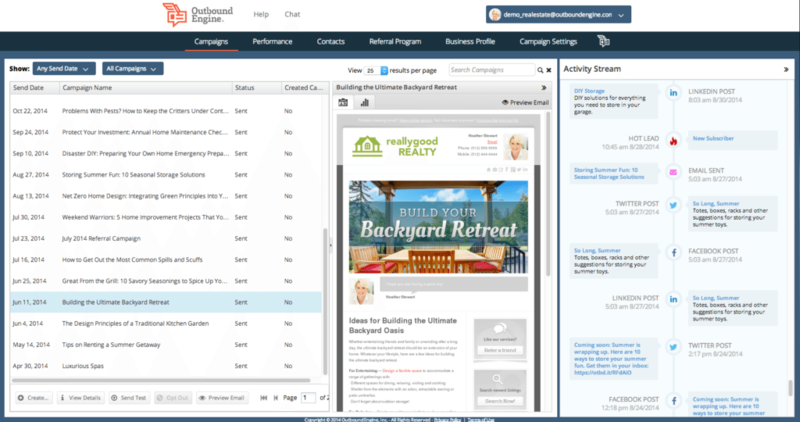 OutboundEngine nicely integrates its email content with intricate social media plans to create a multitude of connection points with customers and prospects. 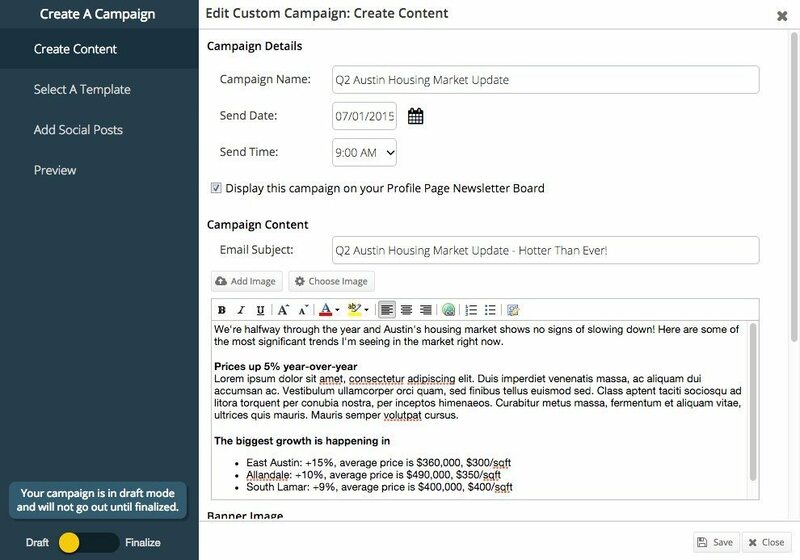 Agents create their own newsletter content or introduce stock campaigns with a brief personal message. 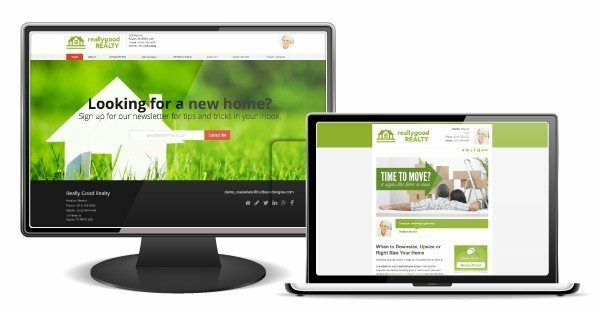 Agents benefit from contemporary newsletter templates and a dashboard revealing a linear, long-term view of what’s being sent on your behalf. Metrics are available, and notes and information about each contact can be added. The Activity Stream is an intuitive, real-time scroll at everything happening in your account, from new leads to retweets. You can dive straight into any required follow-up activities straight from its interface. OutboundEngine’s landing pages are persistent, asking for contact information at every turn, with large calls to action on every page. They can serve as primary sites if yours isn’t up to speed. The social media archive page uses a tile-card view to display all of your Tweets and posts in one place. When collated this way, prospects are offered an in-depth view into your business. Nice. Agents get two emails a month and 30 total tweets and posts. LinkedIn gets less, per best practices. Important to note about working with OutboundEngine: They require all customers to participate in an onboarding call, in which you’re led through the software’s features, its usage and your ongoing role. This is a smart, important contributor to your success. Onboarding promotes buy-in, sets expectations and establishes multiparty accountability. More software companies should do this. I hesitate to call OutboundEngine an email marketing company, because it integrates other critical facets of Web marketing so seamlessly. However, I don’t hesitate to call it an engine. This software can help move your business. Do you use OutboundEngine — and what do you think? Leave a comment and let us know!